It's windy and hot. I look down at my feet...dry, dusty, and flaky. My sandals are worn out, I've been walking down this endless path for hours searching for water. Cool, cool water to quench my raging thirst. I see something in the distance. It looks like water so I start running toward that direction. As soon as I get there I realize it was only a mirage, an optical illusion. There's no water in this place. I wrap my scarf again around my head, this time making it tighter. The winds are blowing more fiercely than before. Tick, Tock. Tick, Tock. Time is running out. The sand particles are forcing their way inside my clothes. I've got to get water. I've got to find it. I'm in a dry and thirsty land. How did I get here? How? I wake up shivering to realize I was never in that place. It was only a dream. We were made to thirst for Him. To seek His face before anything else. To reach the end of the pursuit of happiness and to find it in His warm embrace. Why is there this amazing desire for the Creator in our hearts? Why do we feel empty when we dare to leave His side, even for a short while? It's because without Him we are nothing. He put the desire inside us. He is the Potter and we are the clay, and the clay cannot say to the Potter, "I have no need for you." It's like saying, "I made the sun, the moon and the stars," when I clearly didn't. Or like saying, "I can sustain myself with my intelligence," when clearly, I've failed many times trying to do life on my own. Many of us feel like David felt when He wrote Psalm 42. 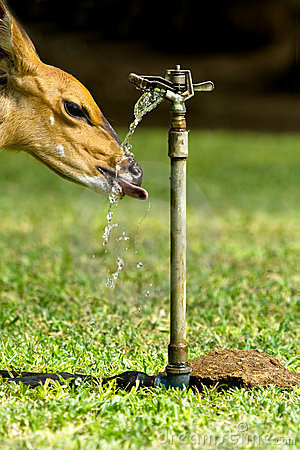 When a deer pants for water, I imagine that you will hear every dry breath coming from within that deer and it will never be satisfied until it has quenched its thirst. So also, when a man thirsts for God you will see it written all over his face and in his actions. He literally will run to God, the source of his strength. He will not be satisfied until he drinks deep. He will find sustenance only in the Word of God. He will be humble always, knowing that he did not design himself. He will be kind to people, forgiving them whenever He can. He will be merciful. A missionary (bringer of good news). A shining light whenever He can. A replica of the Father. It will be evident in His entire life. David said he felt like a deer panting for water, searching for sustenance in God. It was not a mirage. No, not an optical illusion. It was real. And He found it, He put His kingship in second place and put God first, and he became a man after God's heart when he set his priorities straight. When we become like this, God can easily show us the right path. He can easily reveal secret things to us which we would never understand without Him. He can easily hear our prayers and direct us to the answers. Because as water is to a deer, so is God to us. He is our sustenance. He knows everything and without Him we are nothing. Today, my encouragement to you is to renew your thirst for God. Rekindle that old flame. Find those streams you once were led to. Let the Holy Spirit begin to saturate your soul with living water. Because as Jesus told that woman at the well, "If you knew who I was, you will ask me for living water and never thirst again." (paraphrased). Lord, may we thirst for You all the days of our lives and may we find satisfaction in Your living water. Amen.